David Vitter, Running For Governor, Accused Of Being 'Wrong On Fornication' : It's All Politics Vitter was re-elected easily, even after he was caught up in the "D.C. Madam" prostitution scandal. But now that he's running for governor, it's coming back to haunt him. Louisiana voters re-elected David Vitter after he apologized for being involved in a Washington prostitution scandal. David Vitter, the U.S. senator from Louisiana, survived getting caught up in the "D.C. Madam" prostitution scandal several years ago, even winning re-election to the Senate. But now, he's running for governor and his past is getting renewed scrutiny. Vitter campaigns as the true conservative in the race, emphasizing issues that he says line up with Louisiana values. He's anti-abortion and pro-gun rights. At a prayer rally in Bossier City, he decried the ACLU's demands that a public high school remove religious references. "The people versus David Vitter — the evidence shows Vitter implicated in the D.C. madam scandal," a narrator says over news headlines about the scandal. "I am completely responsible. And I am so very, very sorry," he said. "I know this has hurt the relationship of trust I've enjoyed with so many of you, and that I have a lot of work to do to rebuild that." Louisiana voters appeared to forgive him. He easily won re-election in 2010. So in this year's governor's race, Vitter was the early favorite in a field that includes two other Republicans — Lt. Gov. Jay Dardenne and Public Service Commissioner Scott Angelle. The top Democrat is John Bel Edwards, the party leader in the state House. Louisiana has an open primary; all candidates, regardless of party, are on the ballot Oct. 24 with the top two vote-getters likely facing off in a November runoff. Vitter's strategy is to make the runoff, but he's been losing ground. His wide lead in early polls has narrowed so much that he's now polling even with Democrat Edwards. 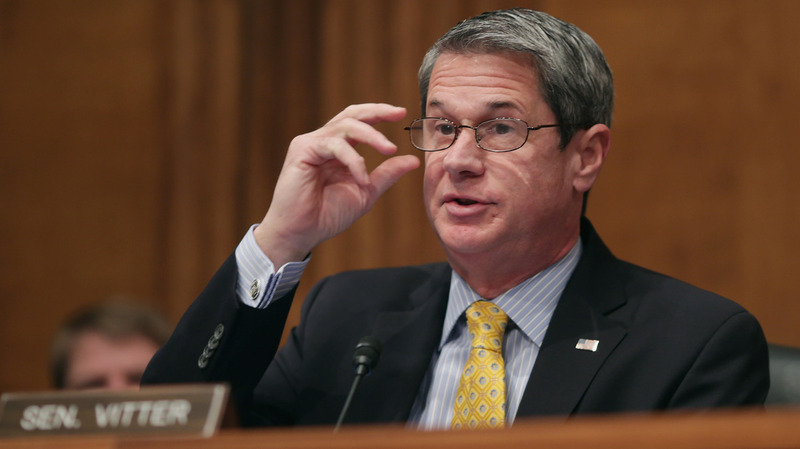 "We can't trust David Vitter to handle our children's education. He's not only been wrong on fornication, he's been wrong on taxation and he's been wrong on education," he said. Vitter avoided the subject, refusing to take questions after the debate. But as he tries to put the matter behind him, will voters? I've been out of favor with Vitter ever since his moral indiscretions. "Well that's the question. We haven't had a chance to test it yet," said Stephanie Grace, a political columnist with the New Orleans Advocate. "The only time Vitter has run before it was such a national election. It was so much about Barack Obama." Vitter would like this governor's race to be about President Obama. His television ads even link his Republican opponents to the president. And in the debate, he went after Democrat Edwards for voting for Obama, knocking him for being "a delegate for Barack Obama not in the 'hope and change' election of 2008, but when he clearly should have known better in 2012." Edwards, he said, "actively supported Barack Obama for president." While polls show Vitter and Edwards in a tight battle now, the dynamics would shift in a head-to-head runoff with no other Republicans on the ballot in a state that has no statewide elected Democrats. That's the challenge for Edwards. He was grand marshal of the Tangipahoa Parish Fair parade. Campaign volunteers rang bells for Edwards as he waved from atop the lead float. His dad was the sheriff there, and Edwards, a veteran and West Point graduate, campaigns on similar conservative themes as the Republicans in the race. He's anti-abortion and pro-gun rights. But he also plans to expand Medicaid and promises to reverse the unpopular policies of Republican Gov. Bobby Jindal, who's term limited. He paints Vitter as a hypocrite, saying he's "the paragon of conservative Christian values to hear him ... and nothing could be further from the truth." "I'm not about to be lectured to by the likes of David Vitter on those types of issues. I have been faithfully married to my wife, my high school sweetheart, for 26 years," he said. That message is working for Mike McClaurin, a pastor from Ponchatoula, La. He said he is an independent "but I've been out of favor with Vitter ever since his moral indiscretions." We all are sinners. I don't hold that against him at all. Still, philandering politicians are not a rare breed in Louisiana – former Gov. Edwin Edwards, a Democrat convicted of corruption, famously quipped the only way he'd get beat is if he were caught with a "dead woman or a live boy." Republican Rep. Bob Livingston, then speaker-elect, resigned in 1998 after an affair. At the prayer rally in Bossier City, Sandy Tomb from Benton, La. says she's leaning toward Vitter for governor. His past moral indiscretions are not an issue for her. "He asked for forgiveness. He's been forgiven. And we all are sinners. I don't hold that against him at all," she said. Vitter will find out if other voters agree on Oct. 24.